Pocatello, Idaho- Dr. Jeff Meldrum, associate professor of anatomy and anthropology at Idaho State University, is a member of the scientific team examining a plaster cast of what may be the first documented body imprint of a Sasquatch. The imprint of what appears to be a large animal's left forearm, hip, thigh, and heel was discovered September 22, 2000 in a muddy wallow near Mt. Adams in southern Washington State in the Gifford Pinchot National Forest. 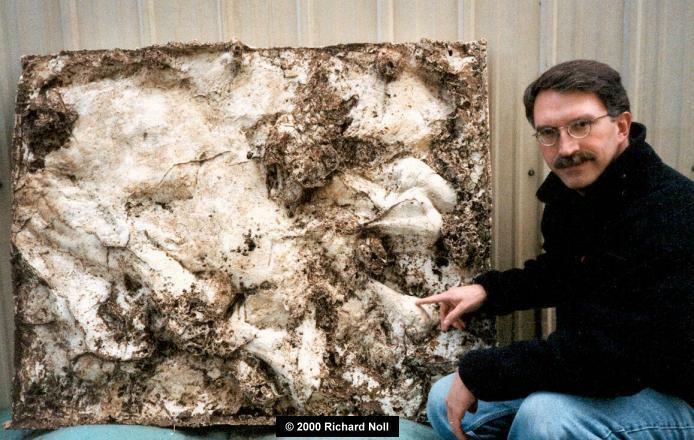 Dr. LeRoy Fish, a retired wildlife ecologist from Triangles Lake, Oregon, with a doctorate in zoology from Washington State University; Derek Randles, a landscape architect from Belfair, Washington and Richard Noll, a tooling metrologist from Edmonds, Washington discovered and cast the partial body imprint during an expedition. More than 200 pounds of plaster were needed to produce the 3-1/2 x 5-foot cast of the entire impression, which was reinforced with researchers' aluminum tent poles. Other Sasquatch evidence documented by members of the expedition includes voice recordings and indistinct 17-inch footprints. Hair samples collected at the scene and from the cast itself and examined by Dr. Henner Fahrenbach, a biomedical research scientist from Beaverton, Oregon, were primarily of deer, elk, coyote, and bear, as was expected since tracks in the wallow were mostly of those animals. However, based on characteristics matching those of otherwise indeterminate primate hairs collected in association with other Sasquatch sightings, he identified a single distinctly primate hair as "Sasquatch."